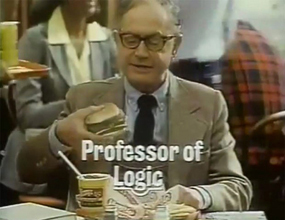 In 1981, Wendy's hamburgers expanded their menu with a greater variety of food items. 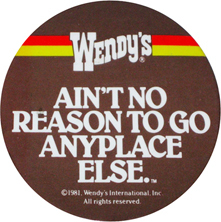 To communicate the new menu, Wendy's conducted a national ad campaign with the slogan Ain't No Reason (to go anyplace else) with founder Dave Thomas making his first appearance as Wendy's spokesperson (but that's not him below, that's from a different spot for the same tagline). 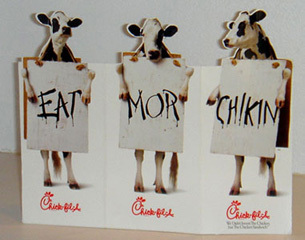 Chick-Fil-A has been running this campaign for a while. 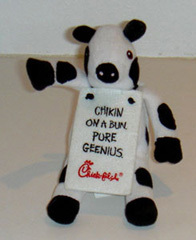 One in which some very capable and clever cows plead with the reader to eat less of them and more chicken. It really does take a village to raise a child. All of us - schools, teachers, friends, parents, families, stores, car dealerships, and companies must take responsibility for the education and healthy growth of children. It is an investment that pays off for all of us. 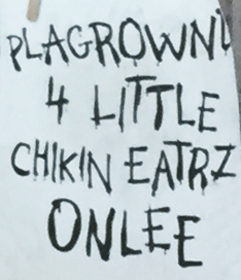 "Playground for little chicken eaters only." And we hope, their accompanying adults. Here, a kid entering the play area sees words that are unfamiliar and thinks they must be okay - "But, mom, I saw it at Chick-Fil-A." This sign isn't even clever in the cow language. No adult would chuckle or respond with 'How cute'. If they're going to use poor grammar, that should be reserved for advertising (if they must), but it shouldn't be used within the restaurant on materials where the message should be clearly and respectfully communicated and are influencing children. 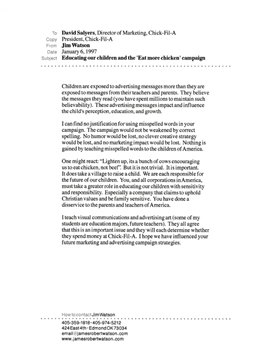 Children are exposed to advertising messages more than they are exposed to messages from their teachers and parents. They often believe the messages they read (companies spend millions to develop and maintain such believability). These advertising messages impact and influence the child's perception, education, and growth. There seems to be no justification for using misspelled words in the ad campaign. The campaign would not be weakened by correct spelling. No humor would be lost, no clever creative strategy would be lost, and no marketing impact would be lost. Nothing is gained by teaching misspelled words to the children of America. 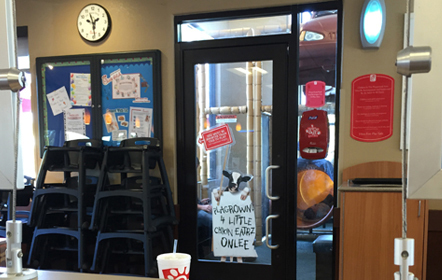 Chick-Fil-A prides itself on family values - the stores are closed on Sundays so employees can spend time in church with their families. One might react: "lighten up, its a bunch of cows encouraging us to eat chicken, not beef". But it is not trivial. It is important. It does take a village to raise a child. Corporations in America must take a greater role in educating our children with sensitivity and responsibility. Especially a company that claims to uphold Christian values and be family sensitive. 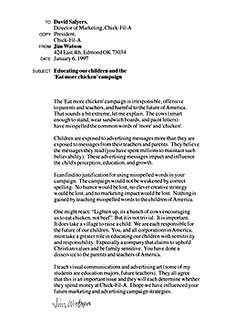 On January 6, 1997, I sent letters to Truett Cathey, President, and David Salyers, Marketing Director, explaining the rationale detailed above. I wanted to appeal to their sensitivity to children and families. The president sent me a copy of his book, It's Easier to Succeed Than to Fail, with a handwritten note in which he agreed that we should all help educate children. But, he said they were quite happy with the ad campaign. See the second line of copy: It's for hair that ain't goin' nowhere. 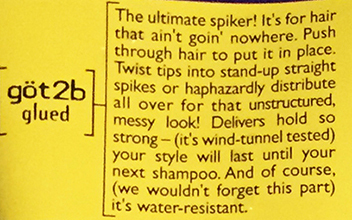 This hair spike product is likely bought and used (and sometimes read) by young people. Exposed to ads and their copy more than they are exposed to the teachings of their teachers and parents, they have little reason to doubt that the ad copy would be incorrect. It becomes familiar and accepted. This product and it's corporation has failed in helping make America better; it truly does take a village to educate young people.